I'm five and half months pregnant and I think I'm already in full on "nesting mode." I have this uncontrollable urge to clean, organize and prepare our home for the arrival of our baby. I think I've cleaned out and organized every closet in our apartment at least three times. The nursery furniture has been ordered and should arrive by the end of October. In the meantime, I thought I'd share some recent nursery additions. Remember that ugly light fixture (last seen here) that I hated so much? 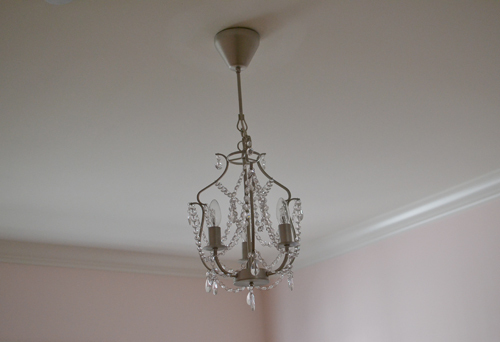 It's been replaced by a chandelier that gives the room a truly magical feel. Happy Friday everyone! 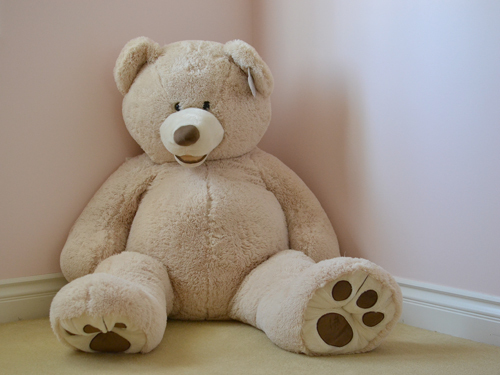 I couldn't resist bringing this big guy home from Costco. How adorable is that face? Yes, the outfit shopping has already started! P.S. - Congrats to Sarah S. on winning the K Kane gift certificate! You should have an email from me in your inbox! How adorable- I love the wall art especially! Love this! I have that chandelier in my room! 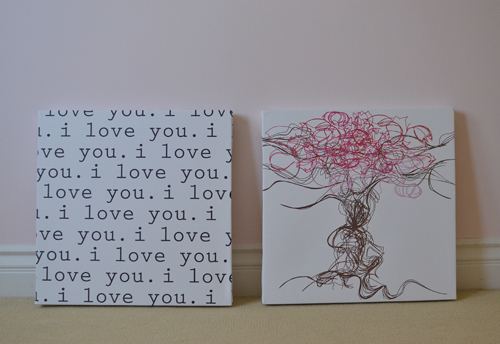 :) Love the wall art too! 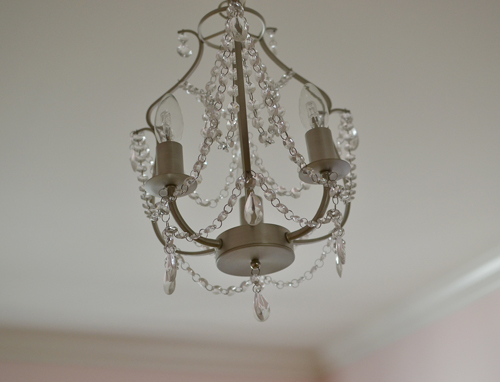 The chandelier is a perfect touch for your little princess! :) The room is coming along nicely, can't wait to see it filled with furniture (and a baby). Happy Friday and weekend, Audrey! P.S. Can't believe you're already 5 1/2 months... time flies. love this! hope you will share the finished pictures of the nursery as well! That chandelier! I die. Love! So exciting! Getting to design your own nursery is the best! And the clothes...don't get me started on how fun those are to buy! eeeek, everything is so cute! I just love the light pink on the walls. Cannot wait to see how it all turns out. OMG, how adorable! And chic! The baby is going to love fashion too :) I really love the chandalier. Love these items, Audrey! So precious for the little girl's nursery -- especially love the chandelier and the art! Awesome finds! :) Cannot wait to see the photos when it's all completed! oh my gosh LOOOVE!! going great so far!!! So sweet ! I love to see nursery rooms and each details from this room is wonderful ! The nursery looks so gorgeous! The pink shade on the wall is perfectly calming and radiates a great atmosphere! And you look still beautiful!! Wonderful chandelier, beautiful color on the walls! the cutest nursery ever!! So happy for you darling.